Just like I admire those who drink black coffee, someone goes up a notch when they order a dirty martini. The ultimate grown-up beverage, a dirty martini is an icy clean combination of gin (or vodka), shaken with a touch of dry vermouth and olive juice. Though typically served in a classic martini glass, the cocktail has a hard-won reputation — no one dares mock its fanciness. With all my respect for the gravitas and style of martini, I’m abashed to admit it’s not my drink. A wine drinker from top to bottom, I’ll sometimes mix in an evening cocktail when the occasion arises. But not having the metaphorical chest hair to handle a dirty martini, I’m often left disappointed with the sweet flavor profile of cocktail menus. I crave the clean salinity of a dirty martini, but still need training wheels to brace the alcohol-on-alcohol profile. Lately, as I’m fixing an after-dinner drink for my boyfriend (a dirty martini man if there ever was one), I want a go-to martini recipe for myself. Craving a drink that’s clean, without the sugar or silliness of spa cocktails, I landed on this rendition. Leaning on muddled cucumber for refreshment and flavor, the martini is bolstered by a squeeze of lime and slip of honey. For the coup de grace, I added a half dropper of Papa & Barkley’s 1:30 THC:CBD cannabis tincture as a medicinal float. 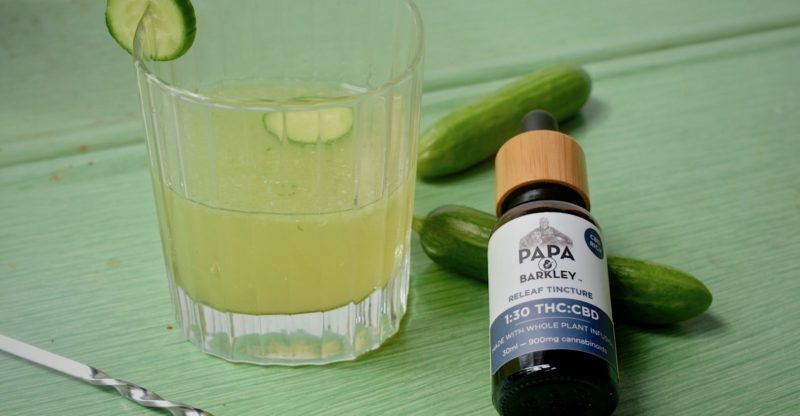 Cucumber and herb martini with Papa & Barkley cannabis tincture. Photo by Nora Mounce. Papa & Barkley uses premium Humboldt cannabis to render a variety of cannabis topicals and tinctures. The CBD-dominant tincture in this recipe adds a touch of herbaceous flavor, while safely delivering medicinal cannabinoids. With less than .25 mg of THC in the ½ dropper, the tincture won’t mess with your headspace – or the taste of your cocktail. In 2018, more Californians are enjoying the medicinal benefits of CBD cannabis products. While more research on the science of the endocannabinoid system is needed, legalization has allowed consumers to experiment with cannabis-infused products in the privacy of their homes. Tinctures can be a versatile delivery system for cannabis and a natural pairing for relaxation as you wind down with your favorite beverage. Cheers! Instructions: Trim ends off a cocktail cucumber (alternatively, use one-third of an English slicing cucumber) and thinly slice. Reserve a slice or two for the garnish. Place remaining cucumber in a cocktail shaker; muddle. Add gin, dry vermouth, lime juice and honey simple syrup. Shake vigorously. Using a strainer, pour drink into martini stem or tumbler (pictured). Finish with ½ dropper of CBD tincture and enjoy! Honey Simple Syrup: A great alternative to white sugar syrup, the honey lends a subtle flavor and is just as easy to make! Combine equal parts honey and water in a small saucepan. Bring to a simmer and whisk until honey is dissolved. Remove from heat and cool. Store the honey simple syrup in the fridge for up to two weeks. Disclaimer: The cannabis plant produces more than 80 different cannabinoids, or cannabis compounds. These compounds can have additive effects when combined with alcohol. Always do the cannabis dosage math, measure carefully and be especially sure to not overdo it. Nora Mounce writes about food, wine, health, cannabis and community in Eureka, California. 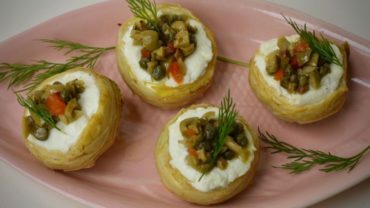 An amateur photographer and avid home cook, Nora is a regular contributor to the North Coast Journal, The Emerald Magazine, Edible Shasta-Butte, HelloMD and The Emerald Report. On Twitter @NoraMounce.